Build a partnership with a direct lender that offers exceptional service. We offer in-house agent marketing support providing the following services: POSTCARDS | FLYERS | VIDEO | PHOTOGRAPHY ÂŠ2019 Finance of America Mortgage LLC is licensed nationwide | | NMLS ID #1071 (www.nmlsconsumeraccess.org) | 300 Welsh Road, Building 5, Horsham, PA 19044 | (800) 355-5626 | AZ Mortgage Banker License #0910184 | Licensed by the Department of Business Oversight under the California Residential Mortgage Lending Act | Georgia Residential Mortgage Licensee #15499 | Illinois Residential Mortgage Licensee | Kansas Licensed Mortgage Company | Licensed by the N.J. Department of Banking and Insurance | Licensed Mortgage Banker -- NYS Banking Department | Rhode Island Licensed Lender. Photography: iPhotography Studio, Michelle Fairless Photography, Rob Paino Graphic Designer: Garon T. Arrias Editorial Manager: Trudy Van Writers: Ben Angel, John Boe, Haley Freeman, Jim Rohn, Walter Sanford, Dirk Zeller, Zig Ziglar Craig Harrison, Simma Lieberman, Chris Widener © Copyright 2019 Executive Agent Magazine. All rights reserved. Reproduction in whole or in part without written permission is prohibited. Although every precaution is taken to ensure accuracy of published materials, Executive Agent Magazine cannot be held responsible for opinions expressed or facts supplied by its authors. knowledge, professional know-how and personal care to every transaction for an unprecedented real estate experience. take your time for casual chatter, or in some cases gossip, will be greatly reduced and everybody, including management and leadership, will be very unhappy about that. Chances are good, regardless of the job market, the most productive people with the right attitude are the ones who really have more job security, and in most cases a better income. When you feel good about yourself and your productivity, you probably will also be performing better at home. When there is no job related stress you are more aware of your mate and children, if you are a parent. You will spend more time being better organized so you can spend more time having that balanced life that all of us are really interested in. Planning for a balanced life will enable you to deal with the physical, the mental, and the spiritual aspects of your life. It will also enable you to develop more friendships, and stronger, better, more lasting relationships. There are many benefits that go with making the plan a daily part of your life. Time well spent results in more money to spend, more money to save, and more time to vacation. It will allow you to attend more of your children’s ball games or school functions as well. A plan is always successful if the plan is good. And if you’ve been on the job for any length of time, you can develop a better plan of action so that everyone benefits from it. I’m talking about planning today for tomorrow’s future. Think about it. I promise you’ll be more productive, happier, healthier, and have a much better chance for increased income when you are secure in who you are, where you are, and what you’re doing. I sincerely hope you’ll take action immediately to get that plan into your daily life. Zig Ziglar is a beloved author and America’s motivator. He is the author of 25 books and offers training and consulting to organizations all across the globe. To learn more about Zig and his business visit his website at www. ziglar.com. to close, we’re close by. • 30-year amortization, due in 15 years • $871,450 max. loan amount, as low as 620 FICO • 1-4 unit properties • Customized and competitive pricing without Fannie Mae standard loan level pricing adjustments! up to become a real estate professional who helps people find their piece of beachfront paradise in one of South Countyâ&#x20AC;&#x2122;s sought-after coastal communities. t’s Murphy’s Law. The line you get in at the department store doesn’t move because there is a lady at the register who waited until the last minute to dig through her overstuffed wallet for a coupon. So you change checkout lanes only to get stuck behind a man digging through a deep pocket for exact change. minded, successful people. How did they get where they are? How do they think? Let the osmosis begin. 3. Speak positive words. We tend to believe what we say. Our minds literally go in the direction of our words. Of course, we can’t talk ourselves into being taller, but we can have a more positive outlook by noticing the good, anticipating a positive outcome and speaking it out loud. It’s almost impossible to shout, “I feel fantastic!” and be depressed at the same time. A few verbal affirmations throughout the day will go a long way toward lifting your spirits. 4. Laugh anyway. There is so much to stress over these days—politics, the economy, the ozone layer, the missing button on your favorite shirt. Still, there is a consensus among many medical professionals that laughter will do you a world of good. In fact, the Mayo Clinic article “Stress relief from laughter? It’s no joke” says, “A rollicking laugh fires up then cools down your stress response and it can increase your heart rate. The result? A good relaxed feeling.” To stay upbeat and positive, make laughter a deliberate part of your arsenal against the blues. 5. Execute. Once you’ve identified what deflates your spirit, made a plan to overcome it and developed some mental weapons, it’s time to bring out the big guns. Put your thoughts into action. It’s hard to worry about a problem while you are busy solving it. This is no time to be passive. Get angry. Get aggressive. Attack your problems with a vengeance. What right do they have to destroy the pleasure you get out of life? The physical act of execution is a diabolical weapon against whatever ails you and can create a surprising sense of bliss in the midst of the turmoil. Charles, who arguably had a much worse day than you, adjusted to his loss and even forgave his thieving friend. He used his skills to move forward in a new career and met a beautiful woman in the process. He learned a lot about himself, found some new priorities and doesn’t stress about the length of a department store checkout lane. He is happier than he has been in a long time and looks for opportunities to share his success with others. If Charles can do it, so can you. you’re uncertain about how to begin. Cathy understands the nuances of each of these scenarios, and she has the expertise to help you find the perfect home in the ideal community for the best price. Although she didn’t always know it, Cathy has been training to become a Realtor® throughout her career. She earned her Bachelor’s degree in Business from the University of Denver, and spent her early professional years in the hospitality industry. Cathy went on to a successful career in corporate sales, and later, devoted time to raising her children and doing volunteer work in LA’s South Bay. The common thread in all of these experiences is that each one enhanced Cathy’s ability to connect with people in a meaningful way. relocated to Rancho Santa Margarita. This is where Cathyâ&#x20AC;&#x2122;s real estate journey began. After buying and selling a number of her own homes over the years, she says she always observed what did and did not work about the experience. She decided that with her combination of skills and knowledge, she could make a positive difference in the way other families experienced buying or selling a home. ood things don’t usually come through happy accidents. The most successful people design their own lives and then live their lives with purpose. Their first step is attaining clarity. I define clarity as understanding and documenting your personal and professional goals, and determining the “why” behind reaching them. It’s vital to developing a clear vision, outlining priorities and objectives, and tackling goals with a real sense of urgency and focus. Clarity is achieved when we know where we are in relation to where we want to go. Without clarity, it is almost impossible to generate the kind of focus necessary to act swiftly and deftly on a daily basis. If you have no clear vision, there is nothing to tie your objectives to and nothing to measure your progress and performance against. When you have clarity about your vision, you discover yourself being pulled toward it, and all you have to do is follow the connecting opportunities that carry you along, allowing you to mark your victories faster and faster. Think about a time when you’ve been excited and regenerated at the thought of achieving a big goal. There’s nothing like that adrenaline rush. When you have clarity, you get that excitement, building and fueling your energy. Clarity and focus together form the basis of execution. So get completely clear about the things that you want, and then take action. nce we master the art of being, we open the door to a lifetime of happiness. One of the major reasons why we fail to find happiness or to create unique lifestyle is because we have not yet mastered the art of being. While we are home our thoughts are still absorbed with solving the challenges we face at the office. And when we are at the office we find ourselves worrying about problems at home. We go through the day without really listening to what others are saying to us. We may be hearing the words, but we aren’t absorbing the message. As we go through the day we find ourselves focusing on past experiences or future possibilities. We are so involved in yesterday and tomorrow that we never even notice that today is slipping by. Lifestyle is learning to be wherever you are. It is developing a unique focus on the current moment, and drawing from it all of the substance and wealth of experience and emotions that it has to offer. Lifestyle is taking time to watch a sunset. Lifestyle is listening to silence. Lifestyle is capturing each moment so that it becomes a new part of what we are and of what we are in the process of becoming. Lifestyle is not something we do; it is something we experience. And until we learn to be there, we will never master the art of living well. Jim Rohn knows the secrets of success - in business and in life. He has devoted his life to a study of the fundamentals of human behavior and personal motivation that affect professional performance. He can awaken the unlimited power of achievement within you! Reproduced with permission from the Jim Rohn Weekly E-zine. Copyright© 2006, Jim Rohn. All right reserved. For information about Jim’s keynote presentations and seminars, contact the FrogPond at 800.704.FROG(3764) or email susie@FrogPond.com http://FrogPond.com. trends and nuances influencing household formation, this yearâ&#x20AC;&#x2122;s report has an increased focus on to the impact of language and culture in the home purchase transaction and includes recommendations on marketing strategy to more effectively reach the Hispanic consumer. WHO WE ARE Established in 2011, the USA Homeownership Foundation, Inc. DBA Veterans Association of Real Estate Professionals (VAREP), is a nonprofit 501(c)(3) organization dedicated to increasing sustainable homeownership, financial-literacy education, VA loan awareness, and economic opportunity for the active-military and veteran communities. WHO CAN JOIN? Any individual regardless if you have served or not. VAREP and its members represent and work within all sectors of the real estate, housing and financial services industries... WE WANT YOU! uccess in life depends upon being strong, people with clear goals and indomitable spirits. Unfortunately, most of us are not born that way. We grow that way. And that growth can either come from us entering willfully into situations that will cause us to grow, like subscribing to Made for Success, or from the way we react when circumstances come upon us without our consent. The latter is what we call adversity. Most of us spend our lives trying to avoid adversity, and I guess that is just as well. We should not pursue adversity, but when she arrives, we should welcome her as a foe who, though our interaction with her, will make us into better people. Every contact we have with adversity gives us again the opportunity to grow personally and professionally and to forge our character into one that will achieve much later on. With that in mind, here are some thoughts on adversity, and how it can help you to succeed in every area of your life and achieve your dreams. Adversity brings out our resources. Horace said “Adversity reveals genius, prosperity conceals it.” When everything is going well, we coast. There is not a lot of stress, and we do not have to draw too much on the resources that reside within us. But when adversity comes we begin to draw upon each and every resource that we have in order to conquer the circumstances at hand. Adversity then, keeps us sharp. It keeps us using our personal muscle, if you will. That is a good thing because we grow through the use of our resources. Adversity brings us together with others. Sure a team can have their problems with each other, but when they on the court, when they experience the adversity of facing another obstacle, they pull together. One for all and all for one, as they say. The next time you experience adversity of some kind, keep your eyes open for how it can bring you together with your family, your co-workers or your team. Then when you are through it, you will find a bond that was created that was not there before. Adversity makes us better people with stronger characters. Never underestimate the power of adversity to shape us inwardly. How will courage, discipline and perseverance ever flourish if we are never tested? After adversity, we come out stronger people and able then to use our character and influence in an even greater way to lead those around us and to improve their lives as well as our own. Adversity makes life interesting. John Amatt said, “Without adversity, without change, life is boring.” How true. Have you noticed that while we are in the middle of adversity we only long to get out of it, but we then spend a lifetime recounting it to anyone who will listen? This is because it spices life up a little. Imagine how boring life would be if everything always went well, when there was never a mountain to be climbed. Here are some questions for you to reflect upon before I close: Q. If you are in the middle of some adversity right now, what resources are you drawing on? Who are you drawing closer to and working with? What part of your character is being tested, and built up? What can you do to view this adversity as one who will be better for it on the other side? Every adversity, every failure, every heartache carries with it the seed of an equal or greater benefit – Napoleon Hill Chris Widener is the President of Made For Success. He teaches leaders how to become Extraordinary Leaders. Chris’ speaking and consulting services have challenged the best to become optimists, to pursue excellence relentlessly, and to dream big dreams. Copyright© 2007, Chris Widener. All rights reserved. For information about Chris’ speaking and consulting services, contact the FrogPond at 800.704. FROG(3764) or email susie@FrogPond.com; http://www. FrogPond.com. 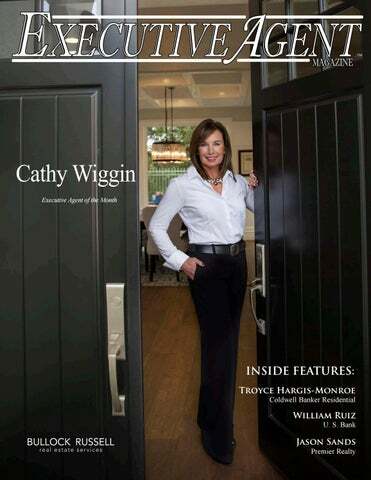 You too can tell us your story and be featured in a local issue of Executive Agent Magazine. LiveLook Innovative Technology designed to give you 24/7 access to all of your transaction information! What do I get with LiveLook Prelim?